I had hoped to write something touching as a post-Christmas post. Instead, I have spend the last several days napping and reading. I hope you have all dodged the many viruses that have graced the rest of us with their presence. Here is a treat for you all. Hodie! Alleluia! is the anthem we are learning for Epiphany (1/6/2014). During the holidays, there are many wonderful things to look forward to, like dinner with family, gifts being exchanged, and seasonal music on the radio. But as we settle into Christmas Eve, have you noticed the general sense of being frayed-around-the-edges? People are stressing over getting all the presents they need, putting cards in the mail, and cleaning house for the relatives coming to visit. What we need right about now is a compilation of feel-good viral videos. Here are my nominees for the most epic heroes of the year, 2013 edition. The Boston marathon bombing heroes were the ones who ran toward the sound of explosives, and got right to work tending to the wounded. Antoinette Tuff is the school employee who talked an armed intruder into giving himself up, and when she was called a hero, she said, “I give it all to God. I’m not the hero; I was terrified.” Very much the hero in my book. Then there was this marine, who purposely lost a 5K race to run with boy who’d gotten separated from his group. I’ll never forget the incredibly kind act of the Dairy Queen worker who saw a blind customer drop a twenty dollar bill, then confronted the woman who picked up the money and put it in her purse. The whole city of San Francisco joined forces with the Make-a-Wish Foundation to give “Batkid” a day he would never forget. When I read the story of 40 Billionaires giving away half their wealth, I had to re-read it to make sure it was really happening! And last but not least, my favorite: Big Country, the bus driver who helped a suicidal lady come back from the ledge of a bridge. He said that he’s a football guy, and sometimes, when the coach calls your number, you just have to do what the play calls for. A big, humble hero to end our year on a positive note! Last week, Lori wrote about the marvelous gift of faith that she received from her family. Her post stirred my own memories but that isn’t surprising. Christmas in our household is a time of memory. On the pie safe, we have the figures from my maternal grandmother’s nativity set; the crèche fell victim to a family of mice. My maternal grandmother regularly spoke of her faith and her active prayer life. I especially knew when I was in her prayers. She read faith-based novels and got me hooked on Guidepost magazine. Her jewelry included a collection of tie-tack pins including smiley faces, flags, crosses and angels. She went to church weekly until she was well into her 90’s. 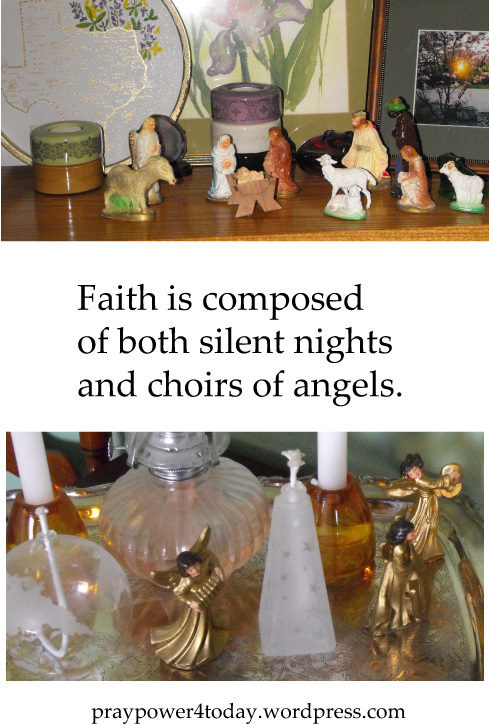 On the buffet, nestled amid the lamps and candles, we have my paternal grandmother’s Christmas angels. I don’t remember this grandmother ever speaking to me of her faith and God, but she lived in West Texas and we lived in Eastern Missouri. My time with her was much more limited. I know she was Methodist and I know these angels were important to her, because she made space for them in her home. Home was a four room adobe with a walk in closet off the back porch. That was the only closet in the house proper although she had another single-room adobe building and a shed. She raised three kids in this limited space and she didn’t keep a cluttered home. If she kept these angels, they were special to her. Faith comes into our families in a variety of ways. Sometimes it is up-front and blatant. Other times it is quiet and subtle. But that’s what Christmas has been about from the start – both choirs of angels and silent nights existing in the same world. No matter which direction your family leans (quiet contemplation or riotous praise), may your Holy Day be deeply Blessed by His Love. I wrote my first poem, at age five, about Christmas — well, specifically, about Santa Claus. It featured scintillating rhymes, for instance pairing “toys” with “good little girls and good little boys.” My audience was unreceptive: My mother was certain I’d memorized it from my sister’s first grade reading book, from which I’d earlier taught myself, pseudo-phonetically, to read, using the names of the letters of the alphabet. I never wrote the poem down; it is lost to history. The literary community continues to not mourn its loss. My Christmas lists, age 11, age 12, age 13, all featured the same item, in ALL CAPS and underlined three times: paper. Paper to write on, to paint watercolors on, even to roll into the antique (to me) manual typewriter that was stored, temptingly, in my bedroom closet. I remember the thrill of looking at that blank, white page. What would end up on it? Even I didn’t know. But of all the wonderful presents I ever received — a silk doll from Chinatown, calligraphy pens, “Free to Be, You and Me,” a Japanese sumi painting kit, more books than one child ought, by rights, to own — the greatest gift I ever received was my faith. This was handed down to me from my mother, from her mother, whom I knew only through stories. From the first of the Bohemian Wattawas to land in America, who built the first Catholic church in their area by hand. I knew from an early age what I’d been gifted. This was a thing that was not taken lightly in my family. Faith had — has always had — a weight and a value. I knew it was dear. There are those who take faith lightly — or not at all. They don’t understand its importance, its life-shaping power. They will not pass it on to their children because they don’t see the need to. But let me tell you this: Faith is every bit as foundational as a good education, one for which you would squirrel away hundreds of thousands of dollars. It is durable, lasting, more sheltering than a home, more practical than a computer. It is the gift of great price, lustrous, comforting and lovely. You can live in it. You can eat from it. It will sustain you. How can anyone think it not worth giving? This Christmas, give the gift of faith. To anyone, to everyone. Let others see you enjoying your faith. Let them see how much you value it. Show it off like a shiny coin. Maybe it will rub off on them. Because this is the gift that everyone needs, the one you really can’t live without — not fully, anyway. Thank you, Mom, for the best gift I ever got. Merry Christmas, everybody. I’ve encountered numerous people who feel this way. In their minds, there are two Christmases. One is joyous and vibrant and bright. It is also commercial — thus the condemnation. My husband and I call this version Stuff-mas. The other Christmas, the Christian one, is solemn and serious and oh so pious. Nothing glitters and beware all things joyful. We don’t have a clever name for this one. We just let them huddle together and moan. We’re Christian but we don’t buy into this version either. Our Christmas has church and music and God at its center. But there are also candles and a tree and things that glitter. And it is the one time of year that I shop. What then do I say to my friends who, like Lorri, have a true reason to feel gloomy? I second Lorri’s own words. If you are in a place of mourning, than mourn unapologetically. If song fills your heart, throw back your head and sing. If you love to shop and give people gifts, get to it. If you love to bake or craft various items, may your hands be busy and glad. You may not be in the midst of a Norman Rockwell Christmas or a Hallmark moment. That’s okay. You could very well be knee-deep in a Bethlehem Christmas. For Mary and Joseph, this wasn’t business as usual. They were on the road because of a government mandate to go be counted in the census. Mary was about to have their first child — government bureaucracy meet life changing moment. Then there were the people who were busy doing their jobs. The inn keeper had record numbers of travelers to take care of. The shepherds were tending sheep. Yet, they were all called together to share this one glorious moment. Engraved invitations didn’t come weeks ahead of time. Christmas came and found them all where they happened to be at just that moment — amidst the fuss and mess that is life. It still works much the same way. Sure, now we know what day it is going to be, but Christmas still has a tendency to catch us in the middle of life. Some of us will be singing. Some of us mourning. Some of us baking. But that’s okay. Christmas will come. I had it all planned out. The post was going to be titled “Have Yourself a Mary Little Christmas,” and it was going to be about embracing chaos and imperfection this holiday season. Like Mary, Jesus’ mother, who did not have such a merry Christmas: mile after grueling mile on the back of a donkey at nine months pregnant? Check. Giving birth in a stable? Check. The bible is glib on the subject of angels, shepherds and wise men, but leaves out the labor pains altogether. It can’t have been easy. Anyway, I was going to go on and on like this, and leave you with pithy parallels to your own holiday madness: Sleeping on the floor to accommodate guests? Hey, you’re right there with the Holy Family! Avoiding a particular family member? Try avoiding a crazy king who wants your child murdered! It was going to be good. Christmas is meant to be a family affair; at our house it meant Christmas in the morning, my birthday in the afternoon (I was born at 5:03 p.m.). This year I will be spending it with my husband’s family, whom I love dearly. But my dad will not be there to share his memory of the Blue-Gray game of 1964, or to reminisce about going out into the rain to buy flowers for my mother — my sister recalls that it was raining; the puddles were nearly up to her waist — or to purchase a necklace at one of the shops at Knott’s Berry Farm, a local theme park. (Who else would be open on Christmas?) He always called me “Honey.” I called him “Daddy,” middle age be damned. I probably should have written the liar post. It would have been easier to read. No one wants to read this; no one wants to be bummed out at Christmas. But the blog was a lie. This is supposed to be a spiritual blog. I guess I ought to be teasing out the spirituality of loss, but I’m just not up to it. So to everyone mourning a loss this Christmas I say: You are not alone. We grieve together, but we also rejoice together. And why? Because of someone else who was born on Christmas, someone who showed us that we never really die; we just move on to another state of being. It’s okay to mourn. But let’s also hang on to the greatest gift of the season, the one represented by that baby in a manger: Hope. I’ll see my dad again someday. I wonder who will win the Christmas football game that year? I squinted at the photo online and then glared at the two stuffed animals I’d just finished. Mine looked lumpy. The ones online? Pure perfection. “I think we’re going to have to go shopping.” I said. Again, he shook his head and assured me that I was striving after perfection yet again. How often do we do this at Christmas time? We can’t send out Christmas cards without a family letter, Christmas stamps and a red gel pen to sign our names . . . . in calligraphy. It isn’t enough to put up a tree, lay out the manger and hang our stockings. 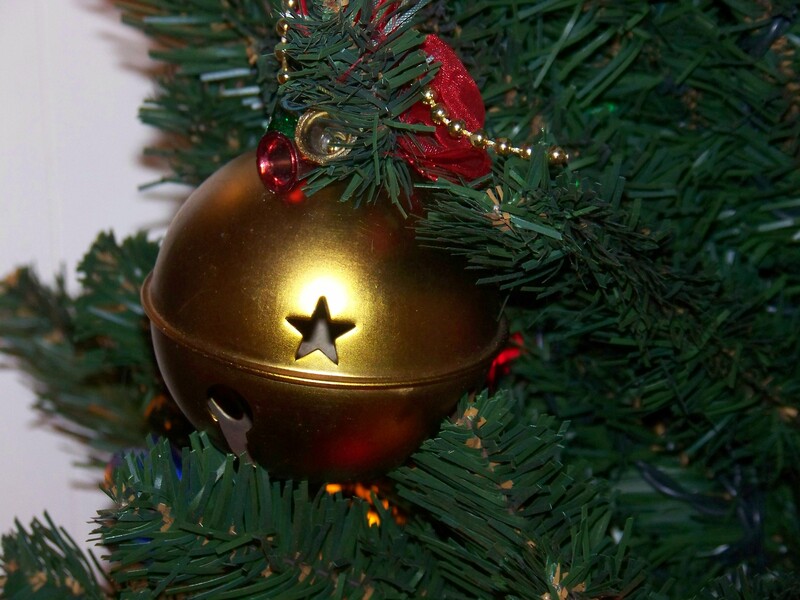 The tree has to have a color coordinated designer theme. And we have to decorate the mantel, wind garland and lights up the stair rail and decorate the front porch. Sweet friends, Christmas was never meant to be perfect here on Earth. 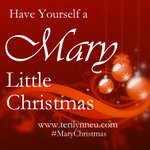 Mary gave birth in a stable. Look at a stable floor some time. Now think about what this floor would have looked like when Bethlehem was full of travelers. If there was no room at the inn, the stable was likely pretty full too. This was not the perfect place to give birth, but even this first Christmas wasn’t about Earthly perfection. That first Christmas, and each one after it, was meant to pull our gazes upward. Don’t stare at the imperfection around you, gaze instead up at Him. His is the vastness of a star filled sky at night combined with the warmth of a stable and a tiny baby. It is about hearing His song and seeing Him among the imperfection of our lives. Now, if you’ll excuse me. I have to sew button eyes on two stuffed animals. They may not be perfect, but nothing here on Earth is. But that’s okay. Christmas isn’t about Earthly perfection. It’s about caring and sharing and Him. 1 Sing joyful songs to the Lord! Praise the mighty rock where we are safe. king over all other gods. he formed the dry land.